Giphy wants to be the one-stop-shop for all your GIF-sharing needs. 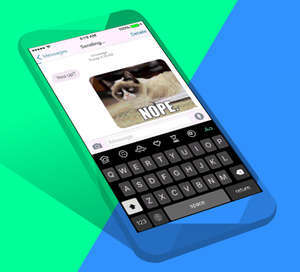 But how does the new Giphy Keys compare to other GIF-focused iOS keyboards? For Giphy, people’s love of GIFs has proven to be no laughing matter. The startup has recently raised $55 million so it can become a one-stop-shop for finding, sharing, and LOL’ing at GIFs on the Internet. On Tuesday, Giphy revealed its latest bid at dominating GIF-sharing with the new Giphy Keys, designed to become your default iOS keyboard. Giphy Keys draws from Giphy’s huge repository of online GIFs so you can browse and share animated images of Kristen Wiig with just a few taps. Giphy Keys lets you share fully-supported GIFs in iMessage, Facebook, and Twitter. You can also copy-and-paste the GIF’s URL. Like any other third-party keyboard, after downloading the app you’ll have to enable the keyboard in your Settings, as well as allow it to have full access. Then you’ll be able to access Giphy Keys by tapping on the globe icon towards the bottom of your keyboard. What sets Giphy Keys apart from other iOS keyboards for sharing GIFs is that it was designed so you can browse and send GIFs without giving up the main qwerty keyboard. Toggling between keyboards can be a pain for iOS users with more than a few keyboards installed, so in this way Giphy Keys is aiming to become your default keyboard. Once enabled, Giphy Keys shows several tabs for searching and browsing GIFs on top of your normal keyboard. You can search by typing a phrase like “Kristen Wiig,” or browse GIFs by emotion or category. In addition, Giphy Keys has a tab for recently-sent GIFs, as well as for GIFs you’ve tapped as favorites. And if you’re feeling lucky, Giphy Keys has an eight-ball section that uses hashtags to generate a GIF. Using #Echo will “animate your words” to compliment your text message. Tap #Weather and then type your zip code to surface a GIF based on your current climate. These commands are similar to the Giphy integration in Slack that generates random GIFs based on a text phrase. However, our experience with Giphy on Slack has been less than stellar, generating GIFs that are too random (or sometimes way inappropriate) for coworkers. Perhaps a random GIF roulette might be better suited for personal messaging. Another issue with Giphy Keys is that it does not allow you to upload your own GIFs that you have stored in your camera roll. Despite Giphy having an impressive library, there are even more GIFs out there. And when you think of that one perfect GIF, finding it on Giphy Keys via search or categories might be way more time-consuming that finding it online and simply uploading it to be accessible on your keyboard. PopKey (iTunes) offers this capability, and it’s saved us a lot of storage space on our iPhone that would otherwise be taken up by our precious, hard-to-find GIFs. Furthermore, Giphy Keys only offers support for iMessage, Twitter, and Facebook. PopKey is also supported by all those messaging services, in addition to Slack, Skype, GroupMe, Hipchat, and Mail. The impact on you: If you share GIFs just once in a while whenever the mood strikes, having your default iOS keyboard suited up with intense GIF-browsing capabilities may be overkill. Installing PopKey with GIFs you’ve uploaded might be a better bet if you don’t mind toggling a few times to get to it. However, if you can’t send a text without a timely GIF immediately following it, then Giphy Keys was designed for you.